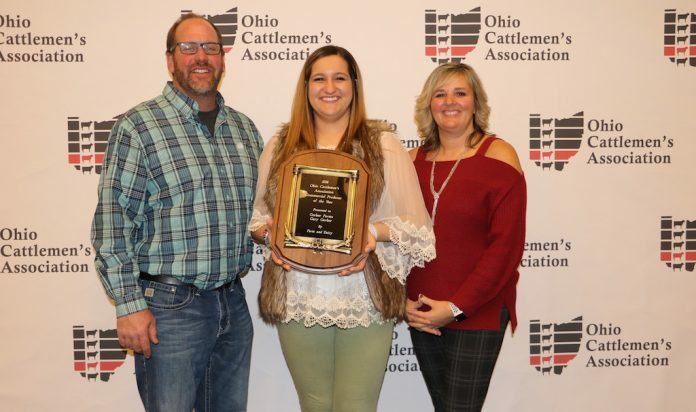 Gary, Kelli and Cari Gerber, of Gerber Farms in Butler County, received the Commercial Cattleman of the Year award, sponsored by Ohio Cattleman’s Association and Farm and Dairy. 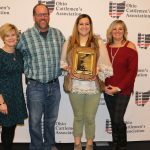 LEWIS CENTER, Ohio — Four family farms and two key beef industry supporters were honored during the Ohio Cattlemen’s Association annual meeting and awards banquet Jan. 20. 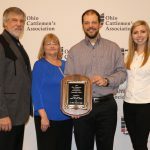 Gibbs Farm, of Shelby County; Kyle Nickles, of Sycamore, Ohio; Gerber Farms, Butler County; and J&L Cattle Service (Harr family), of Ashland County received the association’s top individual awards. This year’s Industry Excellence Award winner, Bob Boliantz, is continuing the work started by his father, who founded E.R. Boliantz Packing in Mansfield in the mid-1940s. He branched out and relocated to Ashland, Ohio, where E.R. Boliantz Co. sources beef from local cattle farms, harvests, butchers and wholesales dry aged and chilled beef. Specific, sourced cuts are branded as Ohio Premium Beef, Ohio All Natural Beef and Ohio Certified Angus Beef. Boliantz is widely respected for working with local cattleman to develop quality beef. He worked with Dr. Francis Fluharty from The Ohio State University to develop and offer classes to teach farmers better feeding practices so their cattle would grade out higher. 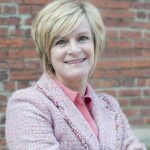 The company also sources and packs Ohio pork and lamb, and all the company’s meats can be found in various retail stores, as well as on the menus of the region’s restaurants. Ohio Rep. Brian Hill received the association’s Industry Service Award. 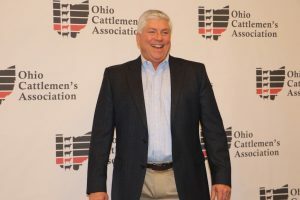 Hill, a longtime association member, raises beef cattle on his family farm in Muskingum County, and is currently serving his third term in the Ohio House of Representatives, after serving as a county commissioner for more than six years. 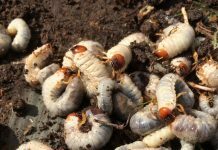 In his role as chairman of the House Committee on Agriculture and Rural Development, the Republican was instrumental in the overhaul of the Current Agricultural Use Valuation formula, which took effect last September. “It’s easy to go to Columbus to fight on your behalf,” Hill told the cattlemen Saturday night. 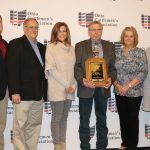 Gary Gerber, of Gerber Farms in Butler County, received the Commercial Cattleman of the Year award. Gerber started farming full-time with his father Jerry after graduating from high school. He is the third generation to work the farm started by his grandfather in 1952. Today, the Gerbers run about 60 Simmental cow-calf pairs and have about 400 cattle in feedlots, in addition to farming approximately 1,800 acres. They market their fat cattle at a local United Producers sale, and also sell some cow-calf pairs and bulls at the Gerber Right Kind Sale in Indiana, operated by Gary’s cousin Doug. 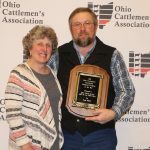 Jeff and Lou Ellen Harr, of J&L Cattle Service, Ashland County, received this year’s Seedstock Producer of the Year award. Read our Jan. 18 profile on the Harr cattle farm. They raise around 250 head of Hereford cattle near Jeromesville, and also custom feed 100 head for other producers. They also sell a few head of show stock to local 4-H members and hold their own production sale every other year. 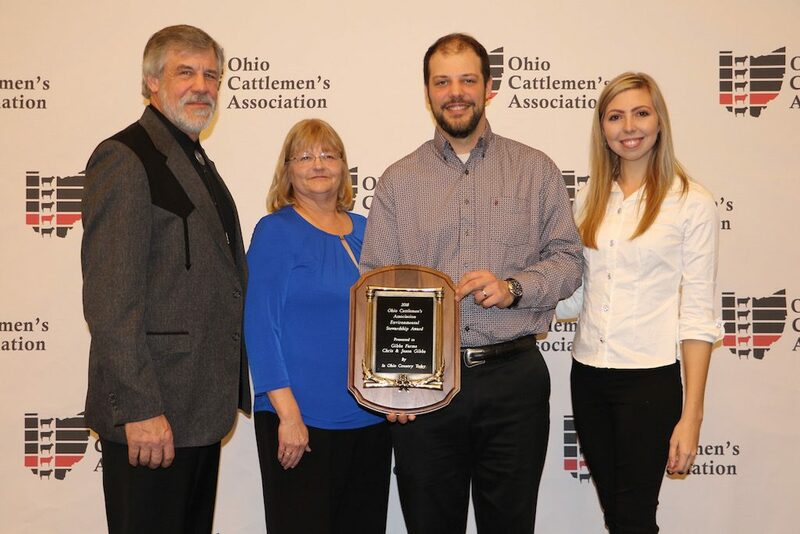 Kyle Nickles, of Sycamore, Ohio, was honored with the Young Cattleman of the Year award for his role in his family’s operation, Wooden Nickle Farms, in Ashland County. He works full-time off the farm at Kalmbach Feeds, but helps his father, Doug, as he can. The Nickles family runs about 80 cows on the home farm, and another 50 cows in a second farm partnership. They feed out 100 head, most of which are marketed through Heffelfinger’s Meats, although some fat cattle go to the United Producers sale at Bucyrus. They also sell some show cattle to local 4-H’ers, sell some breeding stock through sales at the Ohio Beef Expo, and 8-10 breeding bulls per year through private treaty. The father-son team of Chris and Jason Gibbs, of Gibbs Farms in Shelby and Logan counties, won the Environmental Stewardship Award. 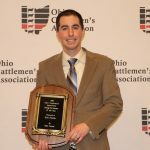 They expanded from a cash grain operation into beef cattle and a managed intensive grazing system when Jason returned to the farm after graduating from Ohio State with an animal science degree. In addition to their own small herd, they manage a second 70-head herd with Charlie, Jordan and Scott Diehl. The Gelbvieh-Angus mix are marketed through Seedstock Plus. During the afternoon business meeting, Dr. Cathann Kress, newly appointed dean of the Ohio State University College of Food, Agricultural and Environmental Sciences, updated members on priorities for the college, and John Foltz, new chair of the OSU Department of Animal Sciences, was also on hand to greet the cattlemen and share his perspectives. 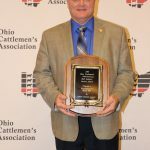 The cattlemen also gave a standing ovation to Dr. Francis Fluharty, an animal scientist at Ohio State who recently announced his appointment as chair of the Department of Animal and Dairy Sciences at the University of Georgia. Fluharty was instrumental in many research efforts, as well as producer and consumer education and outreach related to animal health and growth. He was also a co-inventor of two patents for genetic marker processes (to detect an animal’s potential for marbling and tenderness), and helped develop the branded beef program, Ohio Signature Beef. 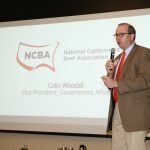 Colin Woodall, vice president of government affairs for the National Cattlemen’s Beef Association, also spoke at both the afternoon and evening sessions, providing a glimpse at the D.C. politics that impacts beef producers. 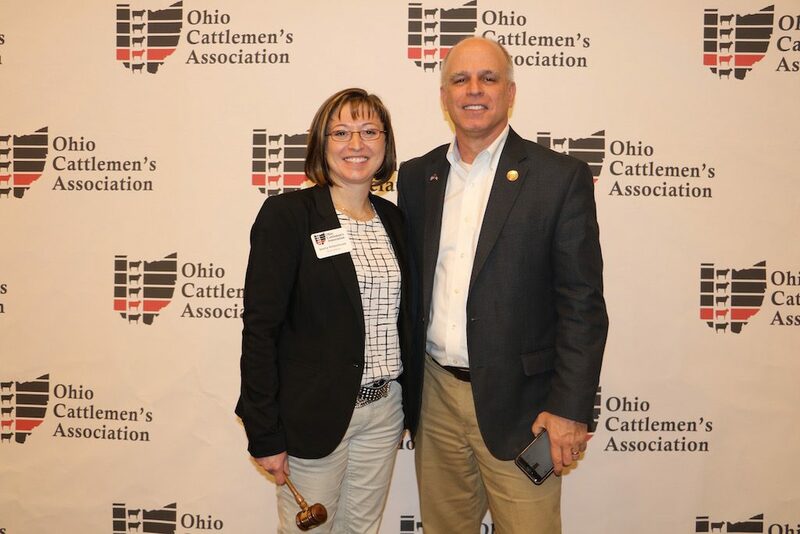 Penny Zimmerman, president of the American National CattleWomen from Minnesota, also participated throughout the day at the Ohio meeting. 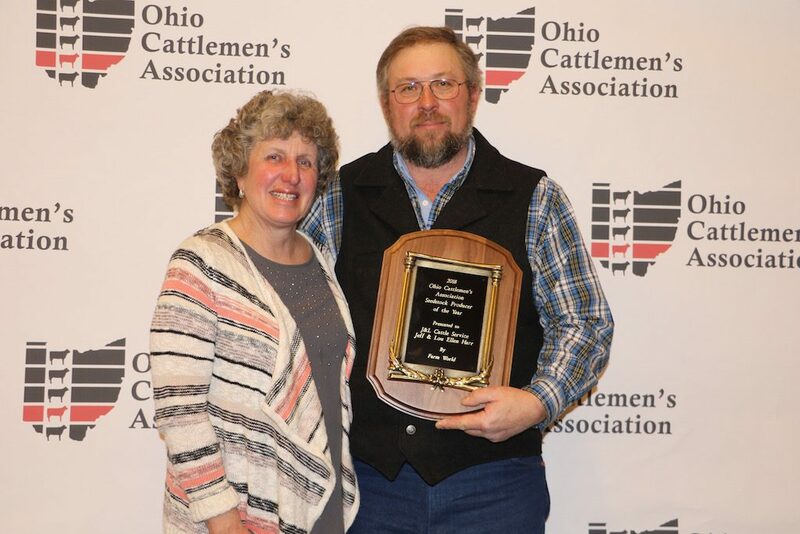 Lou Ellen and Jeff Harr, of Ashland County, received the Ohio Cattlemen’s Association Seedstock Producer of the Year award. 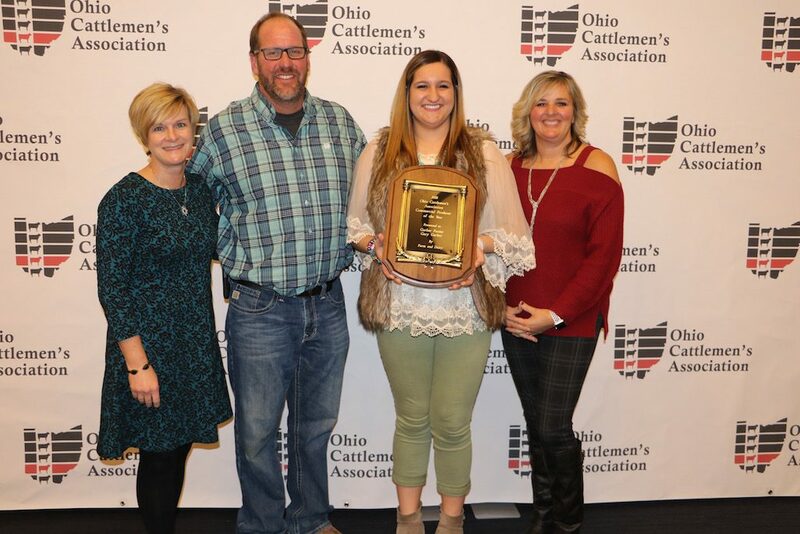 Gary, Kelli and Cari Gerber, of Gerber Farms in Butler County, received the Commercial Cattleman of the Year award, sponsored by Ohio Cattleman’s Association and Farm and Dairy, represented by Editor Susan Crowell (left). Bob Boliantz, of E.R. 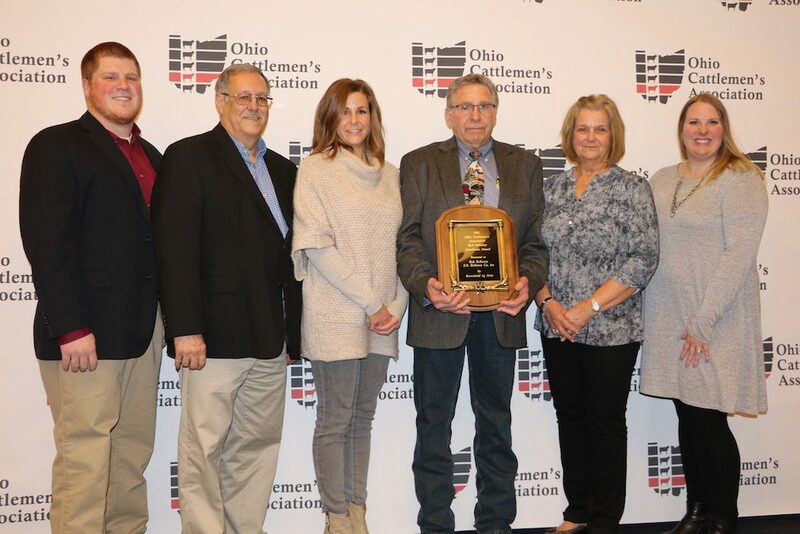 Boliantz Co. in Ashland, Ohio, received the Ohio Cattlemen’s Association Industry Excellence Award for his work building markets through his meat packing company. With him (L-R) are Zane Gross, Russ Chapman, daughter Jessica Gordon, and wife Susan. 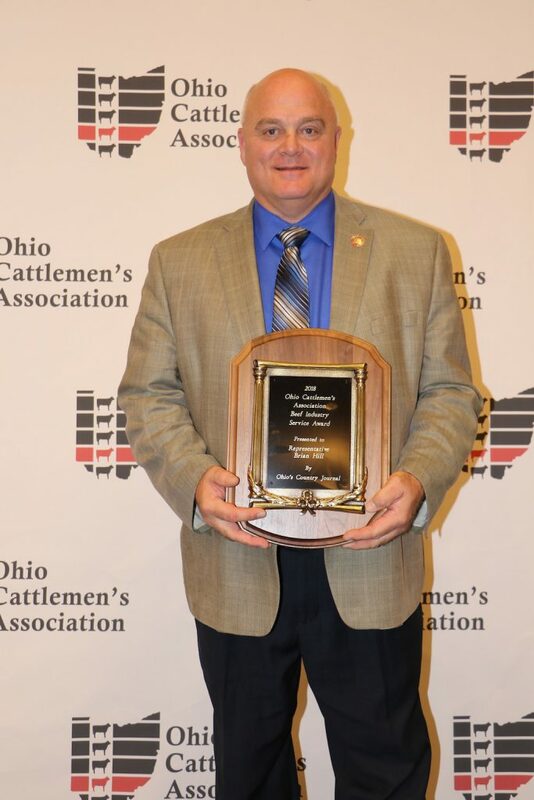 Ohio Rep. Brian Hill, cattleman and chairman of the Ohio House Agriculture and Rural Development Committee, received OCA’s Industry Service Award. This year’s Environmental Stewardship Award went to Gibbs Farm, of Shelby and Logan counties, operated by Chris and Debbie Gibbs (left), and their son and daughter-in-law, Jason and Shelby Gibbs. 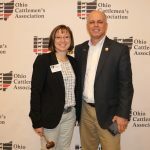 Sasha Rittenhouse, of Clark County, pictured with Ohio Rep. Kyle Koehler, will serve as the first female president of the Ohio Cattlemen's Association. 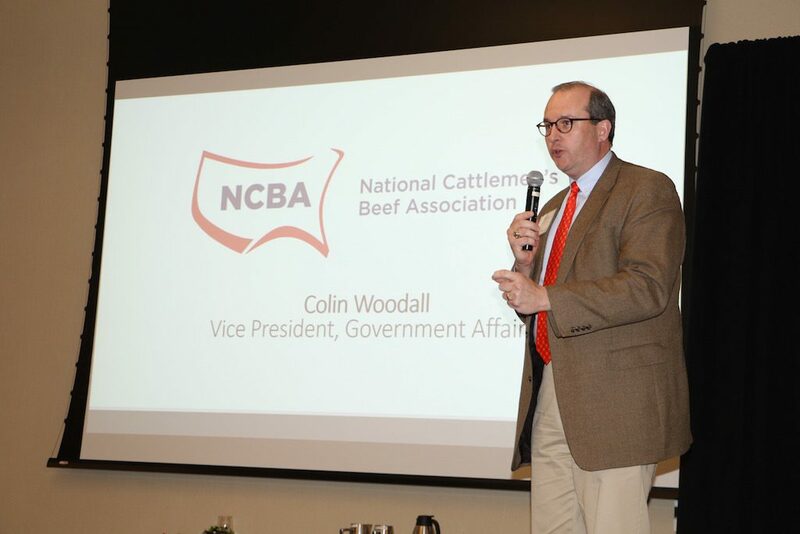 Colin Woodall, vice president of government affairs for the National Cattlemen’s Beef Association, emphasized the importance of international markets for beef producers during his remarks at the Ohio Cattlemen’s Association annual banquet Jan. 20. 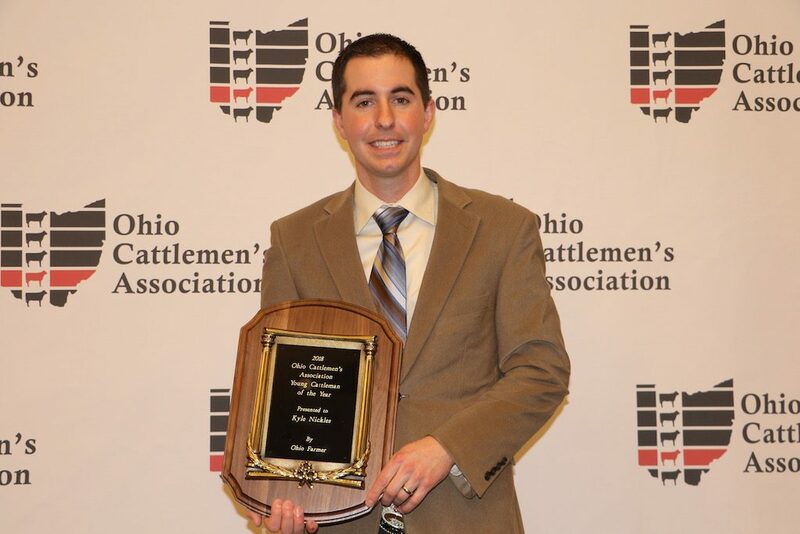 This year’s Ohio Young Cattleman of the Year is Kyle Nickles, whose family operates Wooden Nickle Farms in Ashland County.